My Grilled Chicken Caprese Tarts were inspired by remembering my grandmother’s Caprese salad. She used tomatoes, basil, mozzarella, and a little balsamic vinegar. I thought I’m going to take that idea a step further. I’ve found the grocery store offers a lot of great products that make life in the kitchen easy and fun. Puff Pastry is definitely one of those items that’s a staple in my house. Puff Pastry is available in the frozen section of the grocery store. If you plan on using Puff Pastry for any recipe, transfer the box to the refrigerator the night before. The dough needs to stay cold until your ready to use it. All you need to do after that is to follow the directions on the box. Preheat an indoor grill pan on high heat for 2-3 minutes. To start, *butterfly the two chicken breasts. Lay the 4 chicken breasts out onto a plastic cutting board. Pat with a paper towel all four chicken breast cutlets completely dry. drizzle both sides with olive oil and season with Kosher salt and freshly cracked black pepper to taste. Reduce the heat to medium-high heat. Place the chicken on the indoor grill pan in a single layer and spaced out (depending on the number of chicken breasts you’re cooking), depending on the surface area of your grill pan. Grill 4 minutes per side. Test if the chicken breasts are done using an instant-read thermometer. Internal temperature needs to read 165-degrees F. Transfer the chicken to a clean serving plate, cover with foil to stay warm. Line 2 rimmed baking sheet pans with parchment paper. While your chicken is grilling, dust a flat surface with all-purpose flour. Roll out one sheet of Puff Pastry to a 1/4-inch thick. Using a 6-inch plate and a paring knife, cut out 4 circles. Place two circles of pastry on each sheet pan. Using the paring knife again, score a margin a 1/4-inch from the outside of each circle. This will allow the outside of the circles to puff up slightly and give a tart-like look to the pastry. Take a fork and prick the inside of the circles. This will allow steam to escape and the center of the pastry circles will lay flat. Arrange the tomatoes, sliced red onion, and mozzarella slices in the center of each tart. Sprinkle Kosher salt and freshly cracked black pepper over each tart. Drizzle each tart with 2 tablespoons of olive oil. Brush the outer rims with *egg wash. Follow the cooking instructions on the Puff Pastry box. Usually bakes for 15 minutes. While tarts are baking, slice the chicken on the bias. Transfer the sliced chicken to a mixing bowl. Add the basil pesto and toss to combine. Once the tarts come out of the oven, add the pesto marinated sliced chicken evenly divided over the top of each tart. The heat of the tarts will warm up the basil and it will smell so good. Finally, a few freshly torn basil leaves over the top. This recipe could easily be a vegetarian dish. *Egg Wash: 1 beaten egg whisked together with one tablespoon of water or milk. *Butterfly Chicken Breasts. Place the chicken breast on a plastic cutting board and, with your hand flat on top of it, use a sharp knife to slice into one side of the breast, starting at the thicker end and ending at the thin point. Open out the breast so it resembles a butterfly. Where the breast meets at the center, (open book-like piece of chicken), slice down the center giving you two equal breast pieces, 1/2-inch thick. Heirloom Tomatoes are best at the end of the summer. I was able to find some great Heirloom Tomatoes in all colors and sizes. 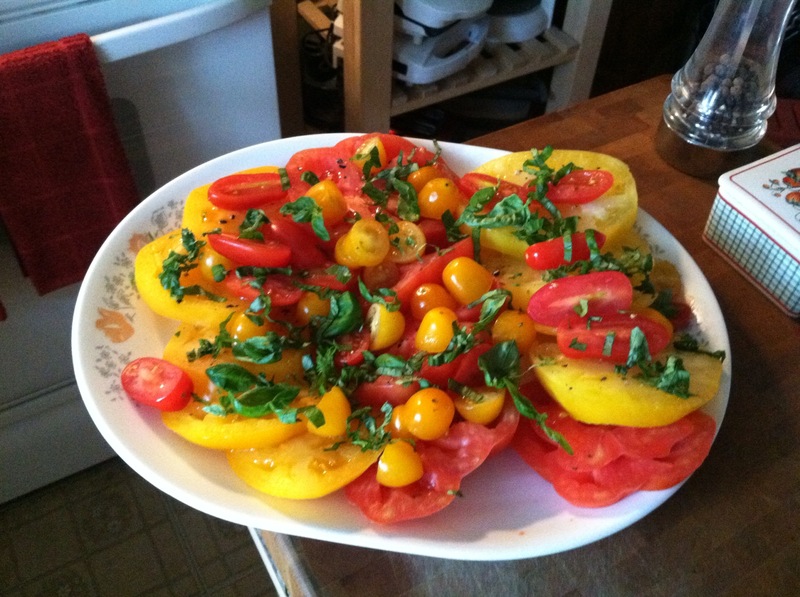 I’ve put together two styles of Heirloom Tomato Salads. The first one is an Heirloom Tomato Caprese Salad combined with fresh mozzarella, fresh basil, Kosher salt, freshly cracked black pepper, and *E.V.O.O. The second one is an Heirloom Tomato Salad that doesn’t require anything but a little Kosher salt, freshly cracked black pepper, julienned fresh basil leaves, and *E.V.O.O. Serve: On a large serving platter, family style. *E.V.O.O. is Extra Virgin Olive Oil.